mp3s when played in Shotcut for some reason skip the first few seconds of the track. Sometimes this happens when previewing the track while it’s in the playlist but it has always happened to me when I bring the track down to the timeline. 1 - Import first a video file and bring it to the timeline. 2 - Click the speaker icon at the track’s head to mute the video track. 3 - Import any mp3 audio that has audio kick in right at the start of the mp3. 4 - Create an audio track under the video track in the timeline and bring that mp3 track to that audio track. 5 - Play the first several seconds of the timeline with the video muted and the mp3’s sound on from the very beginning. 6 - After several seconds, pause it then click the rewind icon to bring back the playhead to the start. 7 - Play it again. The first several seconds of the mp3 should be cut off with it playing several seconds ahead. From that point on you can’t play the first several seconds of the mp3 anymore. This happened to me before the final October build but I forgot about it until now. I recreated this several times already. This does not happen if you are making an audio track out of a video file in the playlist. That means that the current workaround I have until this is addressed is to take a mp3 file I am working with and throw it into a mkv container along with some video and import that into Shotcut. I will also bring up here that at times I have seen that when I import an audio track to the timeline it will be placed a frame ahead of the very start even if the playhead is placed right at the start. This doesn’t always happen and I don’t know what exactly causes this but I will note that here in case that can also be addressed. I do know that when this occurs the playhead from that moment on behaves as if there is some track starting one frame ahead of the beginning of the timeline. Therefore if I click to rewind the playhead to the start it will stop just short of the very beginning as if there there was a track placed there. I have to click rewind one more time then to bring the playhead to the very beginning. I am not reproducing it with a couple of my mp3s. That means that the current workaround I have until this is addressed is to take a mp3 file I am working with and throw it into a mkv container along with some video and import that into Shotcut. Why not just convert the mp3 to WAV?!? What does the playhead have to do with it? You are using very vague terms and not explaining. You can drag-n-drop or Append, neither of which use the playhead. Paste and Insert do use it. OK, big deal. You have to have to pay attention and go back one frame. So, this Is this cause of the above? I’m not sure which rewind you’re talking about. At first I thought you were talking about J, then later in your post it sounds like Alt+Left. I rarely use J, but have been known to use Alt+Left. 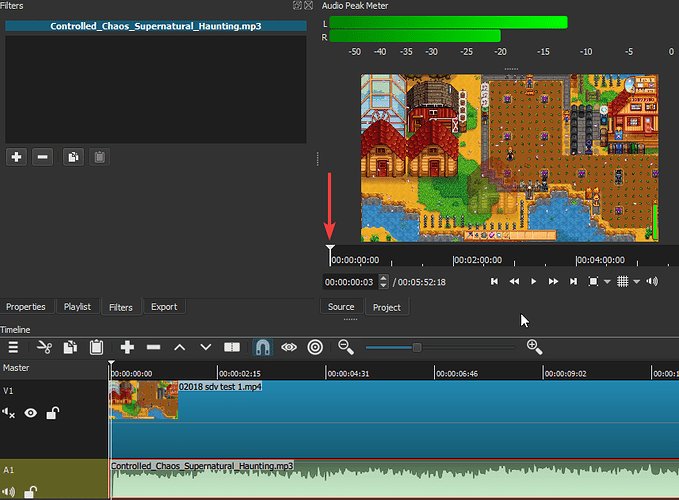 I tend to use the playhead in the project viewer more than anything, or the playhead on the timeline. I couldn’t replicate the issue. Mp3 is from the YouTube music library in the Creator’s Studio. So, this Is this cause of the above? No. Like I said, I brought it up because I have had that happened several times before and it still happens. On some of the tests I was doing for the bug here it happened a couple of times. Since I haven’t discovered why it happens I can’t really start a thread on it. But since it did happen a couple of times again when testing this bug out I decided to bring it up just so you can have it in the back of your head in case you stumble across it yourself or anyone else does. At any rate I have spent more time on this and have finally realized where the problem is. All the steps I wrote above to recreate the bug are irrelevant. This can be recreated playing it right from the playlist. It turns out that any audio file such as mp3 and m4a that has an image attached to the file itself will trigger the bug I described. That means when you have an audio file with an image attached to the file itself and play it in Shotcut then pause it at any point and rewind it AKA “Alt+Left” back to the start and play it again, Shotcut will not play the audio from the start but instead continue to play it from where it was paused. In fact you don’t even need to pause it you can just click the rewind button AKA “Alt+Left” then press play and it will do it just the same. If the audio file has no image attached then this bug will not happen. It turns out that any audio file such as mp3 and m4a that has an image attached to the file itself will trigger the bug I described. OK, this is a problem that I do know about! But if you add a music clip with album art to an audio track, then the problem should go away; it has for me. In the case where you add this music clip to a video track but do not need album art, a workaround is to change the video track to None in Properties for that clip. Can you confirm that? I recently attempted a fix but failed in my first attempt, and I need to revisit it. But if you add a music clip with album art to an audio track, then the problem should go away; it has for me. Interesting. I just tested this by bringing a mp3 track with an image attached and specifically selected to add an audio track to the timeline with no other tracks in the timeline and it did not trigger the bug. In the case where you add this music clip to a video track but do not need album art, a workaround is to change the video track to None in Properties for that clip. Can you confirm that? I also tested it by just bringing that mp3 straight down to the timeline which automatically introduced it as a video track and this time the problem did not happen. So I didn’t even need to go to the Properties tab. I tested it again in the same manner I described in the steps above which means a completely separate video being used for the video track and the problem is recreated. After that I went to the Properties tab and changed the video track to None like you suggested and the problem did go away. Thank you for sharing that workaround. So the bug is triggered when an audio file with image is played from the playlist or if it is added in the timeline as an audio track after a separate video file has been added as a video track. I tested it again in the same manner I described in the steps above which means a completely separate video being used for the video track and the problem is recreated. OK, then the surface area of the bug is larger than I expected or experienced making it more critical since this is a very common use case. It also affects m4a and other formats that use a single image for album art. At the very least, the behavior of these clips in Source player is confusing and misleading. I will be working on this one. I associate the Alt-Left symbol with Skip back, and associate the J as a fast Rewind. I guess I still have the 80’s tape decks stuck in my head. That’s back in the linear days when you literally had to wait forever to rewind a tape. You’d set it to rewind walk away, then a little while later, thump, or a loud click out of no where. As a reminder, the easiest way to go to 0 on the Timeline is to press Home key after ensuring the player is set to Project. And the Esc key toggles between the player between Source and Project. I find these shortcuts easy to remember. After several seconds, pause it then click the rewind icon to bring back the playhead to the start.